Sciency Thoughts: Understanding the extraordinary success of Pines. Understanding the extraordinary success of Pines. Gymnosperms (Non-flowering Seed Plants) first arose in the Devonian, and by the Mesozoic had come to dominate almost all terrestrial ecosystems. Angiosperms appeared some time in the Jurassic or Early Cretaceous, and appear to have initially been minor components of the terrestrial flora, but began to rapidly diversify in the Middle Cretaceous, and by the end of that period had become the dominant group of Plants on Earth, leading to the extinction of formerly successful groups such as the Bennettitales and Seed Ferns, while other groups, such as the Gingkoes, Cycads, and Tree Ferns underwent huge declines, and only survive as relict groups with a few remotely scattered populations today. 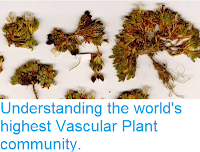 One Gymnosperm group, however, has done remarkably well in an Angiosperm-dominated world. The Conifers, and in particular the Pines, Pinus spp., underwent a significant diversification at the same time as the Angiosperms, and apparently thrived in the environment that these Plants created. 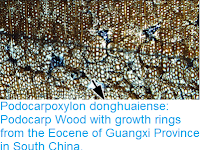 Pines have continued to be a success story in the post-Cretaceous world, and have undergone a series of extra expansions as terrestrial ecosystems became dominated by first Grasses and then Humans. 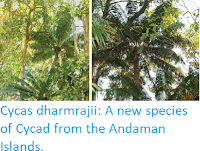 In a paper published in the journal Ecology and Evolution on 21 September 2018, Surendra Singh of the Central Himalayan Environment Association, Inderjit of the Centre for Environmental Management of Degraded Ecosystems at the University of Delhi, Jamuna Singh of the Department of Botany at Banaras Hindu University, Sudipto Majumdar, also of the Centre for Environmental Management of Degraded Ecosystems, Jaime Moyano and Martin Nuñez of the Grupo de Ecologia de Invasiones at the Universidad Nacional del Comahue, and David Richardson of the Centre for Invasion Biology at Stellenbosch University, examine the reasons for the extraordinary rise of the Pines, and their continued success in modern, Human-dominated landscapes. Pines in the Northern (native) and Southern (nonnative) Hemispheres. 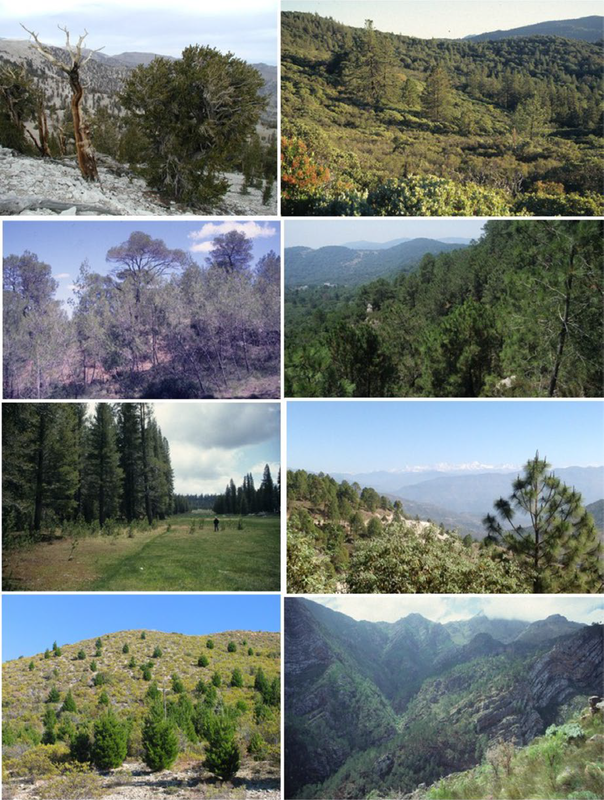 (a) Pinus longaeva in the White Mountains, California, USA; (b) Pinus contorta, southern California, USA; (c) Pinus halepensis, southern France; (d) Pinus pinaster, Andalucía, Spain; (e) Pinus contorta, colonising subalpine meadow, Sequoia National Forest, California, USA; (f) Pinus roxburghii in the Himalaya, Uttarakhand, India; (g) Pinus contorta invading Patagonian steppe vegetation, near Bariloche, Argentina; (h) Pinus pinaster invading fynbos shrubland, Western Cape, South Africa. David Richardson and Inderjit in Singh et al. (2018). 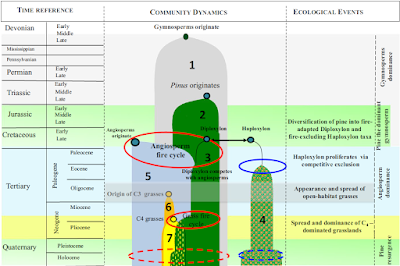 The rise in Angiosperms during the Cretaceous was associated with a changed fire regime; put simply forests of Angiosperm trees were able to survive frequent forest fires while most Gymnosperms were not, so that any Gymnosperm living in an Angiosperm-dominated woodland had a good chance of being killed by each fire cycle, while the Angiosperms surviving it simply grew back. Pines, however, did not suffer this problem, with the genus splitting into two subgenera with different strategies for surviving fire early in the group’s history. Members of the subgenus Diploxylon, sometimes known as ‘Hard Pines’, are fire adapted, having evolved in a number of ways that help them cope with frequent fires. Firstly these trees have thick, fire resistant bark, which protects the vascular tissues of the trunk (cambium) from heat damage; a 15 mm thick bark layer can protect the interior of the tree against external temperatures as high as 400°C for as long as 3 minutes (generally long enough for any available fuel to be consumed at these temperatures). 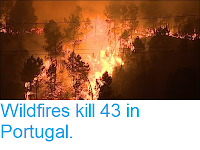 Secondly these Pines produce a large number of long, flammable needles, which drop to the ground around the trees, causing any fires to burn rapidly and intensely, i.e. in a way that the Pine can cope with, but any competitor Plants nearby might find challenging. In some Pine species these needles are retained on the branches, resulting in an intense fire in the canopy, something which again is likely to prove challenging to competitors. In such trees the Pine seeds are typically also retained in cones within the canopy, with the cones only opening and shedding the seeds after being exposed to fire, presenting the new seeds with soil enriched by the forest fire and cleared of competitors. Pines of the subgenus Haploxylon (or Strobus), sometimes known as ‘Soft Pines’, in contrast, survived the evolution of new fire regimes in the Cretaceous by simply avoiding Angiosperm forests completely, evolving traits that enabled them to survive in areas such where Angiosperms could not. These Pines also have thick bark, though in this instance it is used as an insulator against the cold, with such trees able to survive temperatures as low as -90°C, and have closable stomata which enable them to survive in very dry conditions. These Pines developed an ectomycorrhizal relationship (relationship in which the root is surrounded by a sheath of Fungi) with Basidiomycete Fungi by the Middle Eocene, giving them an additional advantage in colonising cooler northerly and high altitude environments, as these Fungi are more tolerant of such conditions than the arbuscular mycorrhizal relationship (relationship in which Fungal fibres penetrate the root) most other Plants form with Ascomycete Fungi; to date only one group of Angiosperms have formed a similar relationship with the Basidiomycetes, the Fagales (Beeches, Oaks etc.). These adaptations have enabled Pines to survive a number of new conditions that have arisen in the post-Cretaceous world, such as the evolution of savanna ecosystems, grasslands with an annual fire cycle, impossible to colonise for trees without adaptations to fires, or the Pleistocene glaciations, during which cold-adapted Pines were able to survive in refugia unavailable to less hardy Plants, giving them a considerable advantage when the glaciers cleared, opening up large areas for colonisation by the surviving tree species. The appearance of Humans has created a number of new opportunities for Pines, firstly through the spread of slash-and-burn agriculture, which sweeps away other tree species, creating opportunities for fire-adapted Pines, and then by the active planting of Pines for their long, straight trunks and excellent timber. Humans have carried Pines to many new environments, particularly in the Southern Hemisphere, where they have often become highly invasive in ecosystems unused to them. Pines have been able to invade a number of Southern Hemisphere ecosystems that were formerly treeless, such as the arid Patagonian steppe, South African fynbos, and the grasslands and shrublands of New Zealand, where dry conditions and periodic fires had excluded native tree species. The ability of Pines to survive at high altitudes has also given them a novel advantage in the Southern Hemisphere, where no other trees are adapted to do this, for example in the native treeline is found at 1950 m above sea level in Chile, and in New Zealand it is even lower at 1350 m, but in both areas Pines can climb as high as 4000 m above sea level, giving them the opportunity to colonise large areas of mountainside formerly free of trees. Key drivers and responses during the evolution of pines. 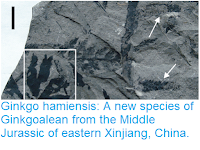 Gymnosperms originated in the Devonian (350 Myr ago), but Pines originated ~150 Myr ago. Oval shapes indicate environmental filters, red ovals for Diploxylon and blue ovals for Haploxylon Pines. 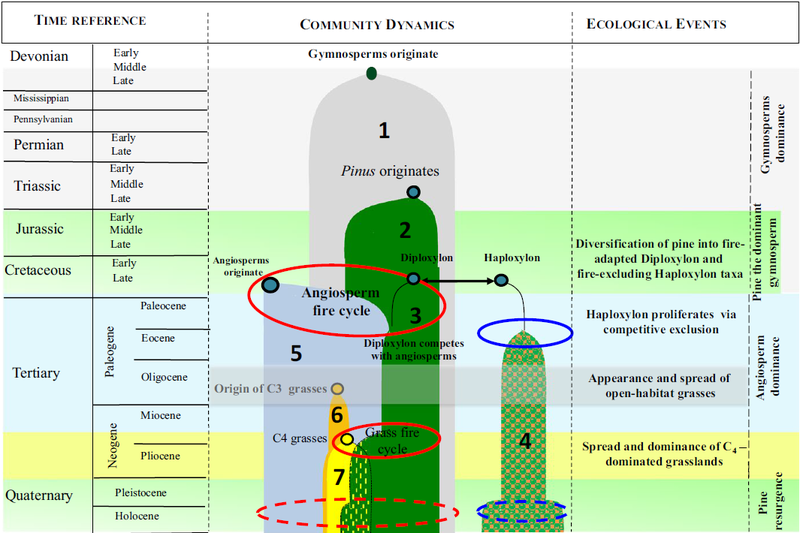 The presence of different groups is represented by numbers: (1) Gymnosperms; (2) Pines prior to diversification; (3) Diploxylon; (4) Haploxylon; (5) Angiosperms; (6) C3 Grasses; (7) C4 Grasses. Solid red ovals indicate fire as a driver, and solid blue ovals denote extreme environments as drivers. Dashed red or blue ovals indicate the impact of humans. Angiosperms, mainly shrubs and herbs, appeared as understorey ruderals in the Late Cretaceous (65–145 Myr ago) and later proliferated in response to novel fire regimes. This resulted in the shift of community structure as slow-growing Gymnosperms were replaced by fast-growing Angiosperms, resulting in the decline of Gymnosperms except Conifers. Changes in the climate in the Miocene (5–24 Myr ago) led to the replacement of woodlands with grasslands dominated by C4 species. Highly flammable C4 grasses became abundant in open areas with higher light availability. Pinus has shown remarkable adaptability to highly flammable ecosystems, including frequently burned C4 grasslands. The timing of Angiosperm evolution overlaps with the origin and diversification of pines into Diploxylon and Haploxylon taxa. 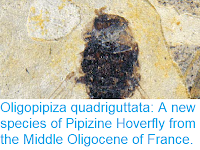 Haploxylon taxa are fire-avoiding and occur in drier and colder regions, whereas Diploxylon taxa are fire-adapted and occur in more productive environments at subtropical and temperate latitudes. Diploxylon Pines evolved to adapt to fire and codominate with Angiosperms in some more productive regions outside tropical rain forests. Singh et al. (2018). Asteroid 2018 US1 passes the Earth. Worker dies in accident at Nevada mine. Flash flood kills at least 21 in Jordan. Asteroid 2018 UO1 passes the Earth. Magnitude 6.8 Earthquake beneath the Ionian Sea. Tourists stung by 'Jellyfish' on Phuket beach. Asteroid 2018 UL passes the Earth. Flooding causes severe disruption in Qatar. Asteroid 2018 TP passes the Earth. Flooding kills at least eight in northwest Iran.